It’s been a while since my last one. So, thought I would get on my bike and go and visit White Cube’s gallery in Hoxton Square. ‘Hoxton Square?’, I hear you cry ,’- that’s been closed for ages! You need to head across the water to Bermondsey Street and see where it’s really going on!’ And indeed it is! Despite trying to pay attention to these things it seems that Jay Jopling has managed to build a new gallery the size of a small museum in the shadow of the Shard, filled it with not one, not two, but three shows and I was totally unaware of it. And I have to say, at the risk of sounding like a broken record (I still think vinyl is for music, not for making trousers out of), that this was a very impressive space. Some of the other large spaces that are reasonably new (Gagosian in King’s Cross and Hauser and Werth in Savile Row for example) seem gratuitously big. But this gallery is much bigger than either of them – big enough to move to another level of large – and that is important. It ceases to be a very large commercial gallery and more like a small institution. A private museum in fact. Anyway, they let me in. 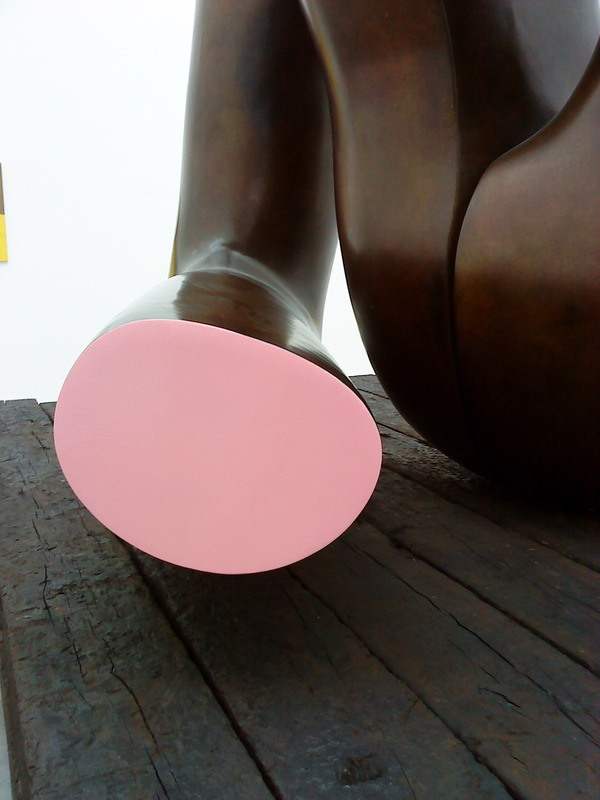 The smallest of the three shows was Gary Hume’s. In the 9x9x9 space, a cube reference presumably. Always had time for his work and he was what I really went to see. A suitably huge bronze was surrounded by some intriguingly surfaced paintings, enough for a normal show, but here just an appetiser. Then I went into the Chuck Close show. It was one of those rare shows where you change your mind about an artist. I had never really engaged with his work, it had never made any impression on me. But this show in its hangar sized space, curated beyond reproach, was a revelation. I clearly was shown that the relation between the process and the work that is critical to him, but in a fascinating way that made the wood blocks that made the prints equal in stature to the prints themselves. And the exhaustive variations that were played out of the same images seemed to make sense, seen in this comprehensive context, they were links between conceptualism and post-impressionism. The process of making, and examining the quality of the process, allowed you closer in to his mind as he made the pieces and feel the detachment of the image from the method. This is an exceptional show. On the way out of that I was startled by a rollerskater in a white bodystocking gliding past. There was one more thing to see. Eddie Peake – who has until now passed me by – had a kind of performance installation. A rather thin chap sat at a synthesiser, noodling away. four or five people lay on the ground in the middle of the room. Another chap was banging a small drum. They were inside a replica of the penguin enclosure at London Zoo. The roller skater rolled around again. There were some pictures, with pseudo-graffiti text on polished steel, slickly made and some small sculptures like white goat turds on plinths that toned immaculately with the polished concrete floor. So far, this one remains undigested. This entry was posted in Art, Galleries, London, Painting, Uncategorized and tagged Art, British, Galleries, London, Painting.